Internal doc says October release for BlackBerry Bold | BlackBerry Blast! Leave it to BGR to show more proof that the BlackBerry Bold will indeed make its debut on AT&T in October. 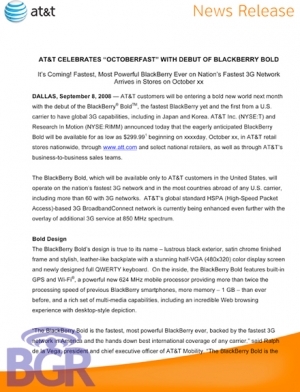 As you can see by the photo they are planning an "Octoberfast" for the BlackBerry Bold release. It looks like the rumored $299 price will be sticking as well. In case you missed it check out the related article link below to get the details on the drama that has been happening between AT&T and RIM. The Boy Genius has all the details on this soap opera.